County officials continue to work closely with administrators at the Adrienne Arsht Center for the Performing Arts as both entities stick to their word of collaborating for the creation of a dedicated parking garage. Arsht Center administrators have expressed concern about building the garage too close to the Florida Department of Transportation’s (FDOT) I-395 Signature Bridge project. The Florida Department of Transportation’s I-395 Reconstruction Project involves rebuilding of the I-395 corridor to increase capacity and improve safety by eliminating geometric and operational deficiencies. New elevated ramps, one for each of the east and west directions, will provide a direct link between I-95 and I-395. The project includes building a signature bridge over Biscayne Boulevard. In addition to the signature bridge, the project will provide enhanced streetscape design underneath the bridge. County officials have been working with Arsht Center administrators to discuss lowering the profile of the parking garage. “We have some options, but we also think it’s best to wait until FDOT chooses the firm for the signature bridge so that we could study this more specifically,” Mr. Spring said. 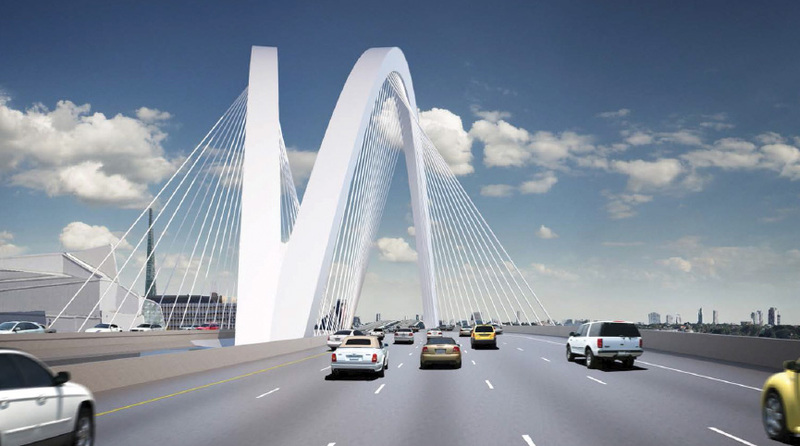 The request for design, build and finance firm proposals for the signature bridge was advertised on Feb. 8, 2016. The I-395 contract, which involved two other FDOT projects, has an anticipated construction starting date of late 2017 and is expected to last five years for an estimated cost of $800 million. The I-395 Reconstruction Project limits are the entire I-395 corridor from the SR 836/I-95/I-395 (Midtown) Interchange to the MacArthur Causeway, approximately 1.4 miles long. “We’re taking a look at working with FDOT – once they have selected someone to design and build the entire length of I-395 – for the parking for the Arsht Center,” Mr. Spring said. The Florida Department of Transportation expects to choose a design-build firm next month, he said. “It would be a more informed decision if we could see which proposal FDOT chooses,” Mr. Spring said. In the meantime, conversations are ongoing to see if the Arsht Center’s dedicated parking could “move around” during the construction of the signature bridge. “We’re talking with FDOT about the short-term, mid-term and long-term parking needs for the Arsht Center,” Mr. Spring said. “FDOT is going to need all of the possible Arsht Center parking garage property for the staging of the roadway construction. Hopefully the garage will have an at-grade retail facade to encourage people to live and work there. A neat idea would be to add New World School of the Arts classroom space there with the idea that the school would have access to the Arsht Center between its scheduled shows. Maybe they could go underground with some of the parking. It should have a residential structure on top of it,using the air rights.There are already too many single purpose garages,just sucking out life out of the city blocks.They are necessary evil,but let’s make it more user friendly,with retail on the street level,as previously mentioned and people present 24/7. I agree, maybe some of the residential could be allocated to performing artists who never have enough money until they get famous which is unlikely for the majority. I agree that the lower level should be lined with retrial/commercial space. In terms of the parking garage, its profile (height) should not compete with the bridge. This could be the gateway to the arts and entertainment district and could tie PAMM and the science museum into downtown activities and events.